From The Producer of "Die Hard" and "Lethal Weapon"
Joe Hallenbeck (Bruce Willis) is an ex Secret Service agent whose life has hit rock bottom. 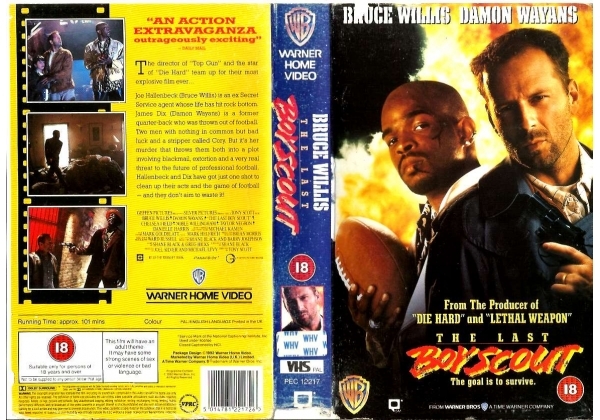 James Dix (Damon Waynes) is a former quarter-back who was thrown out of football. Two men with nothing in common but bad luck and a stripper called Cory. But it's her murder that throws them both into a plot involving blackmail, extortion and a very real threat to the future of professional football. Hallenbeck and Dix have just got one shot to clean up their acts and the game of football - and they don't aim to waste it! Or find "Last Boy Scout, The" on VHS and DVD / BluRay at Amazon.